In general, scissors are cutting instruments that have two blades joined together in the middle so that the sharp edges slide against each other. 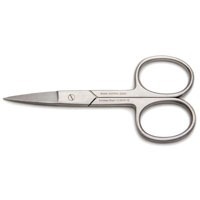 We offer a large variety of scissors, from standard ring scissors to the spring scissors. Here are some options to consider when you are selecting a fine pair of surgical scissors. 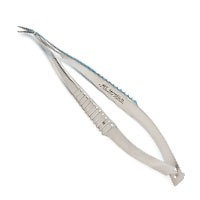 German surgical instruments are known for their quality. These are constructed of the finest German steel by master craftsmen. NOTE: WPI surgical instruments are for laboratory research applications. They are not certified for use on humans. Our standard scissors all have ring handles. They come in a variety of sizes and shapes for any research application. Tips may be straight, curved, angled or bent. You can typically recognize the construction style of scissors based on the following color code: Black handled rings indicate SuperCut scissors. Gold handles indicate that the scissors have Tungsten Carbide inserts. One gold handle and one black handle indicates that the scissors are SuperCut and have Tungsten Carbide inserts. Blue instruments are typically titanium. 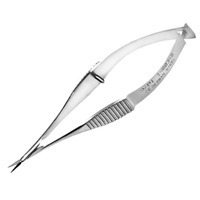 For delicate surgeries or dissections, micro scissors are extremely practical. 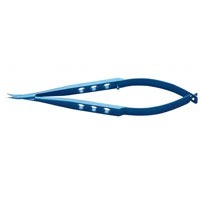 The scissor tips of our intraocular scissors are the smallest tips available, and they have super fine blades. Our standard scissors all have ring handles. They come in a variety of sizes and shapes for any research application. Tips may be straight, curved, angled or bent. 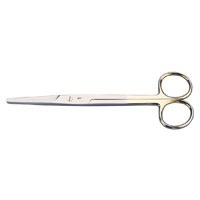 We offer a wide selection of spring scissors including micro scissors, round handle scissors and student scissors.